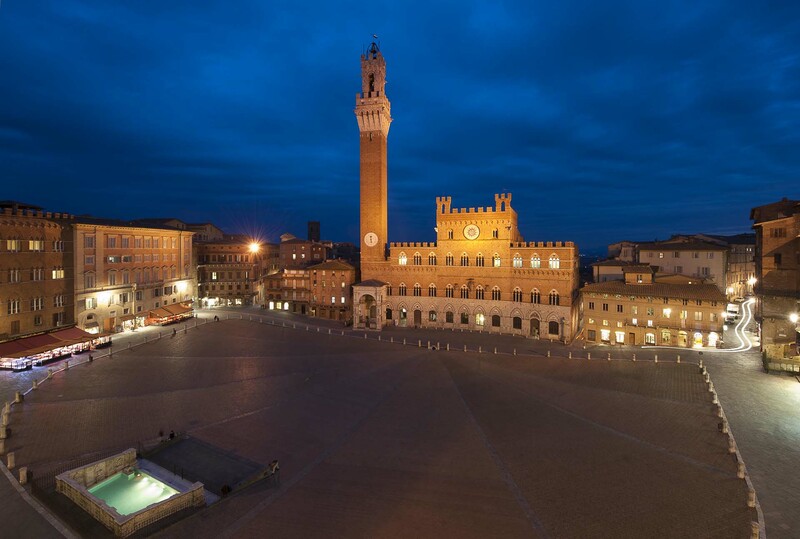 Piazza del Campo owes its name to the field that once housed the market of the city of Siena. It has been declared a UNESCO World Heritage Site, and is considered one of the most beautiful squares in the world. Its shell shape, paved in sedimentary stone, is divided into nine parts, in memory of the nine Lords who had the government of Siena at the end of the thirteenth century.It is the heart of the city of Siena and in it, twice a year (July 2 and August 16), the famous Palio of Siena is celebrated, where knights and horses of the Sienese districts compete on a land composed of tuff and sand. Piazza del Campo overlooks some of the most important monuments of Siena including the Palazzo Pubblico, the building that housed the city government since the '200. The Palazzo Pubblico today houses the Museo Civico with numerous masterpieces by authors such as Ambrogio Lorenzetti and Simone Martini. Another monument symbol of the city of Siena, which can be admired from Piazza del Campo, is the Torre del Mangia, 102 meters high and built in the early fourteenth century: the Tower can be visited and from its top you can admire all of Siena. On another side of Piazza del Campo stands the monumental fountain Fonte Gaia. It is a nineteenth-century copy of the original that was created by the sculptor Jacopo della Quercia in the fifteenth century. According to local tradition, the name would seem to derive from the happiness of the population when it saw the water flow in Piazza del Campo for the first time.